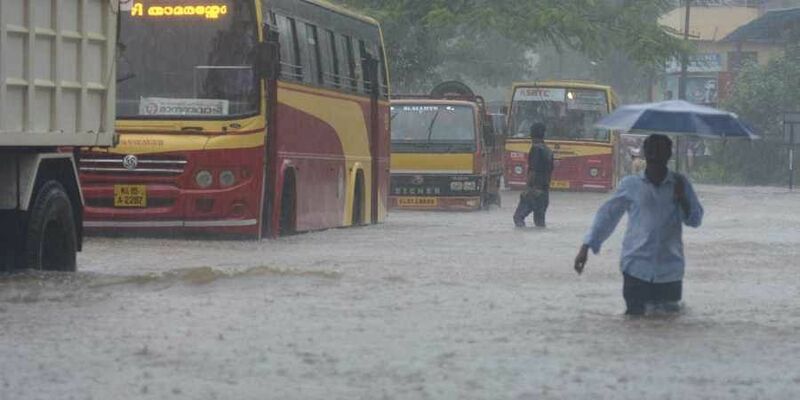 THIRUVANANTHAPURAM: The flood situation in Kerala further worsened today with many areas inundated and flight operations suspended till Saturday at Kochi airport, as the toll rose to 67 with rain fury claiming 25 lives today. The toll in rain-related incidents since August 8 mounted to 67 with 25 deaths reported today, Chief Minister Pinarayi Vijayan said. The prime minister has taken a "positive stand" towards the state on relief measures, Vijayan told reporters. Officials said a holiday has been declared for educational institutions in all districts barring Kasaragod tomorrow while colleges and universities have postponed exams. As flights were being diverted to various airports or suspended, the state government decided to seek the centre's permission to allow small aircraft to land at the Naval airport in Kochi. Airlines including IndiGo, Air India and SpiceJet have announced the suspension of their operations to Kochi. A landslide between Kuzhithurai and Eraniel stations has delayed four long-distance trains, railway sources said adding a few passenger trains have been partially hit. An urgent meeting, convened by the chief minister here to evaluate the flood situation, directed officials to requisition a maximum number of lifeboats from Tamil Nadu. A group of military engineering personnel are expected to arrive in Thiruvananthapuram from Pune by IAF aircraft for rescue operations. With the water level in the Mullaperiyar dam touching the maximum of 142 feet, Vijayan wrote to his Tamil Nadu counterpart K Palaniswami requesting him to bring down the level to 139 feet in view of the dam's safety. Rajnath Singh informed Vijayan that based on the state's request, the Union Home secretary spoke to the Tamil Nadu chief secretary on the release of more water from the dam to bring down the level to 139 feet. Water was released from the dam by 1:30 am this morning as the water level touched 142 feet and people staying in some villages have been relocated. "There is no need for any anxiety with regard to Mullaperiyar dam, where the water level has touched 142 feet, the maximum as allowed by the Supreme Court, as the discharge is equivalent to the inflow," Vijayan told reporters. Peermade in Idukki recorded the highest rainfall of 27 cm today while Idukki town received 23 cm, Munnar 22 cm and Karipur in Malappuram 21 cm. Rains also did not spare Thiruvananthapuram city with low lying areas being inundated, prompting residents to shift to relief camps. Former KPCC president V M Sudheeran and his wife were among the many people shifted from a high-end residential area after rainwater gushed into their house.